A winner of nine races, six stakes and more than $780,000 in purses, Mr. Jordan commands respect wherever he races, but nowhere does the flashy gray 6-year-old gelding have more 'cred' than at Gulfstream Park West. The Eddie Plesa Jr.-trained veteran stakes performer will bring an undefeated record at Gulfstream Park West into Saturday's Millions Classic Preview. The 1 1/16-mile stakes for 3-year-olds and up will be one of nine races for Florida-breds worth a total $675,000 in purses on a Millions Preview Day card that will serve as an early prep for Jan. 19 Sunshine Millions card at Gulfstream Park for many of the entrants. Owned by David Melin, Leon Ellman and Laurie Plesa, Mr. Jordan is 4-for-4 at Gulfstream Park West, all in stakes competition. He is not only undefeated, the son of Kantharos is also untested at the Miami Gardens track while romping to four straight stakes victories by a total of 22 ¾ lengths. After breaking his maiden at first asking at Monmouth Park, Mr. Jordan captured the 2014 Juvenile Sprint Stakes by three lengths and the Smooth Air Stakes by 4 ½ lengths back-to-back. He returned to Gulfstream Park West to capture the 2016 Millions Classic Preview by 3 ¾ lengths before defending his title last year by 11 ½ lengths. Paco Lopez will become reacquainted with Mr. Jordan Saturday. Lopez, who rode Roy H. to victory in last Saturday's Breeders' Cup Sprint (G1) at Churchill Downs, was aboard Mr. Jordan for victories in the 2014 Juvenile Sprint Stakes and the 2016 Millions Classic Preview, as well as the 2015 Pegasus (G3) at Monmoth Park. Mr. Jordan is scheduled to face four rivals Saturday, including Deland and Noble Drama, who have both registered recent victories over the Plesa trainee at Gulfstream. Ricardo Vallejo's Deland enters the Classic Preview off impressive back-to-back stakes victories, taking the July 22 Coast Is Clear by two lengths and the Sept. 7 Mo Exception by eight lengths. The son of Gottcha Gold, a Grade 1 winner in Puerto Rico, came to Gulfstream last fall to compete in the Dec. 9 Caribbean Classic, only to be sidelined with a hoof injury before the race. 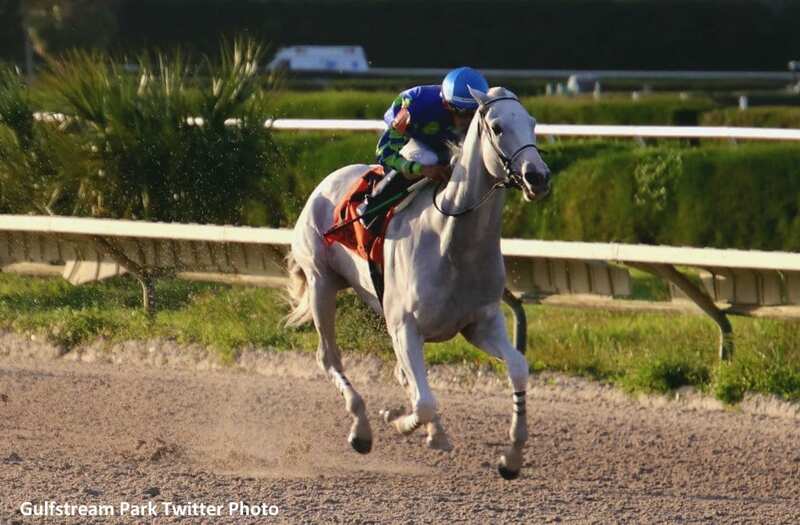 The 6-year-old gelding stumbled and lost his rider at the start of his U.S. debut Feb. 10 at Tampa Bay Downs but showed promise while finishing second behind Imperial Hint in a March 25 Tampa sprint stakes. Deland was transferred to trainer Victor Barboza Jr. two starts later and finished second in the Big Drama Stakes at Gulfstream prior to winning his two most recent races. Both of his recent victories were achieved at a mile around one turn, but Barboza isn't concerned with the addition of a turn and distance Saturday. “I don't think it is a problem for the horse. The horse has won at a mile and a quarter in Puerto Rico,” said Barboza, referring to Deland's triumph in the 2016 Copa Barbosa (G1) at Camarero. Emisael Jaramillo has the return mount. Harold Queen's Noble Drama is coming off a victory in the $150,000 Florida Sire Stakes Wildcat Heir at Gulfstream Sept. 29, prevailing by a neck over Mo Cash and nearly two lengths ahead of a troubled-trip Mr. Jordan. The son of Gone Astray is out of Queen Drama, a full sister to 2010 Eclipse sprint champion Big Drama and multiple Grade 1 stakes winner Sheer Drama. “He came back from that race in good order and he's been working good,” Fawkes said. Queen's homebred 3-year-old gelding's most recent victory was achieved at a mile around one turn. Nik Juarez has the return mount. Midwest Thoroughbreds' Jay's Way is scheduled to return from an eight-month layoff for the Classic Preview. The 5-year-old son of Gone Astray won the Sunshine Millions last year, stubbornly holding off Mr. Jordan by a half-length last year. Trained by Armand De La Cerda, Jay's Way hasn't raced since finishing sixth in the Challenger Stakes at Tampa Bay Downs March 10. Hector Berrios has been named to ride Jay's Way. Arindel's Weisser, who set the pace before fading to fourth in the Wildcat Heir, rounds out the field. Edgard Zayas has the mount. This entry was posted in NL Article, Racing and tagged Eddie Plesa, Florida, gulfstream park west, Kantharos, millions classic preview, mr. jordan, paco lopez, sunshine millions by Press Release. Bookmark the permalink.